Bundesliga | Who comes out on top between Borussia Dortmund's Marco Reus and RB Leipzig's Emil Forsberg? Who comes out on top between Borussia Dortmund's Marco Reus and RB Leipzig's Emil Forsberg? They have a lot in common: blond, dashingly handsome and fiendishly gifted with a football at their feet. RB Leipzig's Emil Forsberg and Borussia Dortmund's Marco Reus have also shared the pain of being on the treatment table in recent weeks, but have both regained fitness to meet for the first time in a Bundesliga game in Saturday evening’s must-watch encounter at the Red Bull Arena (kick-off 18:30CET/17:30GMT). RB’s showstopping Swede and BVB’s world-renowned wide man also share another trait: they make their sides win football matches. bundesliga.com weighs up the pair’s qualities in five of the game’s finest arts, and asks which will come out on top in their duel-at-distance on Matchday 25. Watch: Is Forsberg as cool under pressure off the field? Handily illustrated by his two strikes in as many outings before Dortmund travel east, Reus has an eye for goal, one that is more acutely trained than his RBL counterpart’s. With Reus’ natural bent to come inside from the left and with licence to do so from coach Peter Stöger, the BVB man was always likely to have the jump on Saturday's rival in front of goal. Injuries mean the Germany international has played just 46 Bundesliga games since the start of the 2015/16 season and only three this term. But he has still contributed to 30 BVB goals in that timeframe, scoring 21 of them. In his 44 Bundesliga matches to date, Forsberg has hit the net only nine times. Forsberg’s game is more about the killer pass than the killer instinct. Leipzig’s Bundesliga opponents found that to their cost last season as the ex-Malmö man racked up a jaw-dropping 22 assists in his maiden top-flight campaign in Germany, equalling the record of Kevin De Bruyne — then at Wolfsburg — set two years earlier. He has added two this season to make it 24 in 44 games; Reus’ last 46 Bundesliga appearances have seen him register only nine assists. “Scoring a goal gives you a bigger adrenaline rush than making an assist,” Forsberg told bundesliga.com earlier this season, but it seems the Swede still gets quite a kick out of seeing his handiwork finished off by others. Reus’ result-shaping talent can be most starkly seen in the 12 times he has scored the tone-setting opening goal of a game in the last two-and-a-half seasons, including both his strikes in the current campaign. With five of his top-flight goals being the opener, Forsberg’s ratio is comparable, but Reus’ sheer weight of numbers makes him stand out. Reus takes an average of just 5.2 shots to score compared to Forsberg’s 8.6, but the Swede has actually contributed to more goals — 33 to 30 — in fewer Bundesliga games — 44 to 46 — than Reus, and it is those that change and, ultimately, win matches. They may sprinkle on the glitz in games, grab the headlines, and boast the glamour of catwalk models, but the duo also have the grit required to roll up their sleeves for the common cause. While Reus’ instinct to burst into space means he averages nearly twice as many sprints per game — 33.5 to 17.2 — Forsberg’s penchant for taking on his man means he attempts (255 to 190) — and succeeds (117 to 79) — with many more dribbles. Both don’t mind putting their carefully maintained hairstyles out of joint with Forsberg working up quite a sweat over 11,923 yards per 90 minutes and Reus covering an average of 11,193 yards between kick-off and the full-time whistle. Forsberg averages 54 touches a game, Reus 51, and both win roughly 50 per cent of their challenges … in short, they are team players. The pair will provide the main sub-plot to the game, their respective returns from lengthy spells on the sidelines — 259 days for Reus since his DFB Cup final cruciate ligament rupture; 73 days with a stomach muscle problem for Forsberg — being the one aspect that will stand out before kick-off. After it, the duo will get back to their day job, the one they have done so well when their bodies — particularly in Reus’ case — have allowed. 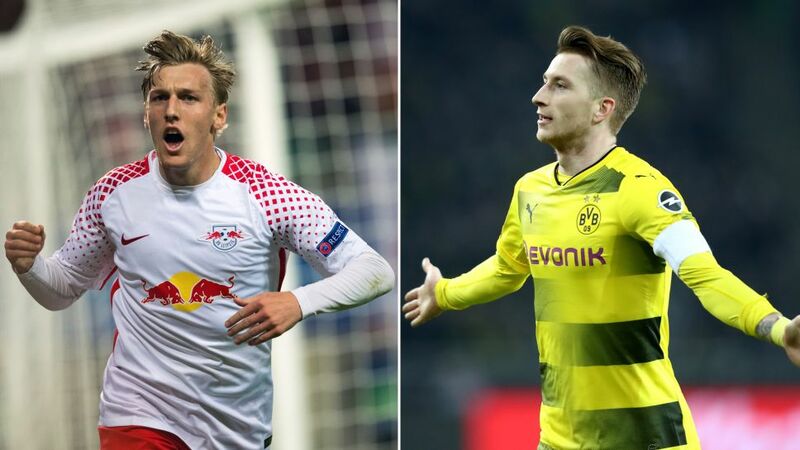 Neither player has registered so much as an assist in their previous appearance against the other’s club, but Reus has the upper hand with one win while Leipzig lost on Forsberg’s only previous battle with BVB. The Germany international has added motivation this weekend, too: score against Leipzig and he will complete the set with a goal against every current Bundesliga club. Add in the fact Forsberg has slipped carefully from the treatment table to the pitch in the last two Matchdays while Reus has hit the turf sprinting over the last three, and the Dortmund man is odds-on to be smiling broadest come full-time on Saturday. Click here for the RB Leipzig vs. Borussia Dortmund Match Centre!